Radiographs of the carpus and manus are needed for evaluation of traumatic injuries and swelling or lameness. Standard evaluation of the carpus and manus includes mediolateral and dorsalpalmar projections. The additional projections described aid in diagnosis of specific disease conditions or evaluation of specific anatomic areas. Stress views are described so that ligamentous and joint capsular stability can be assessed. You should not “survey” a thoracic limb (single open leg lateral or craniocaudal radiograph). 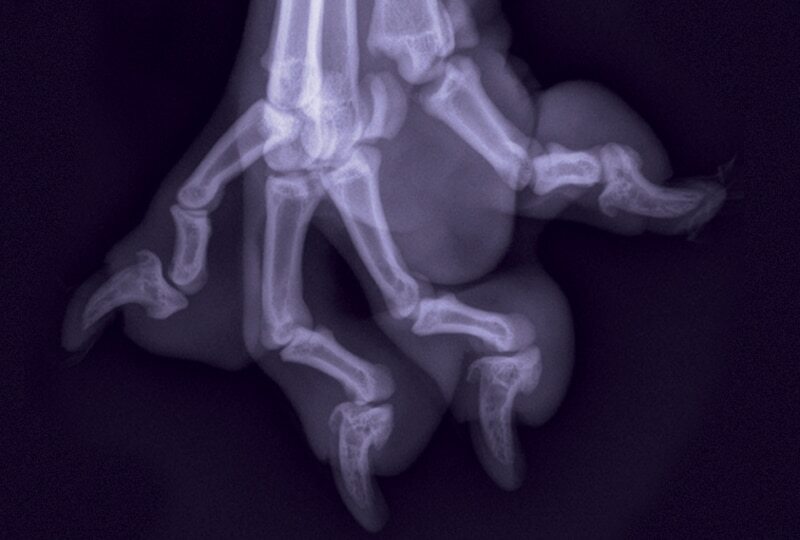 Computed and digital radiographic techniques are sensitive to smaller parts of the anatomy (extremities of small dogs and cats), metal (bone plates, screws, intermedullary pins, etc), and collimation. Because detectors reconstruct the image based on x-ray numbers detected in each element, detector extremes are not handled accurately without artifacts. These extremes would include collimation to a small area (still the goal for radiation exposure purposes) or extreme areas of x-ray attenuation between air and metal associated with the image. This sensitivity means that the technician needs to pay special attention to technique to avoid saturating the imaging plate, resulting in loss of all soft tissue structures or any potential artifacts. For the mediolateral image, the dog or cat is positioned on the table in lateral recumbency, with the affected thoracic limb positioned against the table or imaging cassette/detector. The affected limb is taped and pulled cranially in a neutral position away from the thoracic cavity. A small sponge may need to be placed under the elbow to keep the limb level with the detector/cassette (Figure 1). The unaffected limb is taped and pulled caudally, allowing it to lie along the thoracic cavity and preventing superimposition between the thoracic limbs. Figure 1. Dog positioned for mediolateral collimated image of carpus (A) and corresponding radiograph (B); mediolateral positioning for manus (C) and phalanges (D) and corresponding radiographic images (E and F, respectively). Carpus: Palpate the carpus and center the collimated beam at this point, which should be at the level of the accessory carpal pad. Collimate so the field of view (FOV) includes the proximal third of the metacarpal bones and distal third of the radius/ulna. Manus: Collimate so the FOV is centered in the middle of the metacarpal bones and includes the digits (toe nails included), proximal to the level of the antebrachiocarpal joint. Phalanges: The mediolateral projection of the phalanges requires spreading the digits to avoid superimposition of the proximal sesamoids and digits. This can be accomplished by placing a cotton ball between each digit, taping the nail of digit II and digit V with a (approximately) 12-inch length of ½-inch adhesive tape, and pulling digit II dorsally and digit V in a palmar direction, taping these digits to the detector/cassette or table. If the digit lacks a nail, tape around the entire digit, recognizing there will be tape artifact superimposed over the digit (proximal phalanx). Radiopaque markers can be placed dorsal to the second digit and palmar to the fifth digit as well to avoid confusion (Figure 1). Mediolateral projection: Measure the thickness at the level of the carpus. Dorsopalmar projection: Measure the thickness at the level of the carpus in the dorsopalmar direction. For either projection, the techniques will use a table-top technique instead of a grid. Mediolateral projection: Marker placed dorsal to the limb within collimated area. Dorsopalmar projection: Marker placed along the lateral aspect of limb within collimated area. Carpus: Center the beam on the carpus, collimating to the carpus. Manus: Center on the mid metacarpi, collimating from the distal radius to the end of the digits. For the dorsopalmar image, the patient is positioned on the table in ventral recumbency, with the carpus or manus of the affected limb positioned against the imaging cassette/detector to reduce magnification and geometric distortion. The affected limb is pulled cranially, placing the carpus, manus, or phalanges in the center of the imaging cassette/detector (Figure 2). The unaffected limb is placed in a natural position and the patient’s head is placed on this limb. This positioning rotates the affected limb, optimizing the positioning of the manus. Large-breed dogs can be placed in a V-trough in order to keep the dog upright. Ensure that the unaffected limb and head are outside the V-trough to avoid summation artifacts. Carpus: Palpate carpus and place the center of the collimated beam at this point. Collimate so the FOV includes the proximal third of the metacarpal bones and distal third of the radius and ulna. Manus: Collimate so the FOV is centered on the mid to distal metacarpal bones and includes the digits (toe nails included) proximal to the antebrachiocarpal joint and distal radius/ulna. Phalanges: The dorsopalmar projection of the phalanges requires spreading the digits; follow the instructions for doing so under Mediolateral Projection. Figure 2. Dog positioned for dorsopalmar collimated image of carpus (A) and corresponding radiographic image (B); dorsopalmar positioning for manus (C) and phalanges (D) and corresponding radiographic images (E and F, respectively). 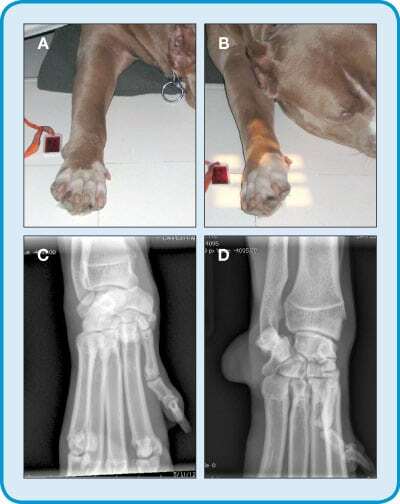 For more information regarding digital radiography artifacts, see the article, Digital Radiography Artifacts, in Veterinary Radiology and Ultrasound, available at vitalrads.com/pub/Digital_Radiography_Artifacts.pdf. In some cases, additional radiographic projections of the manus and pes will be necessary. Indications for flexed mediolateral, hyperextended mediolateral, and stress dorsopalmar/plantar projections of the carpus, tarsus, carpometacarpal, and tarsometatarsal joints include evaluation of soft tissue injuries for possible collateral damage/rupture with resultant joint instability (Figure 3) and identification of articular fractures. These ancillary radiographic projections allow for the application of stress to the joints of the carpus in an effort to identify joint space widening that is encountered with damage to the soft tissue supporting structures of the joints. Flex the phalanges toward the palmar aspect of the carpus and secure with adhesive tape using a figure-eight that is applied around the metacarpal bones distally and the distal radius/ulna proximally. Center the FOV at the flexed carpal joint so the proximal metacarpal bones, all of the carpus, and the distal radius/ulna are included in the collimation. Apply adhesive tape around the radius/ulna, pull the tape caudally, and anchor to the imaging cassette/detector. Apply another strip of tape around the metacarpal bones, pulling dorsally, and anchor the tape to the cassette/detector or table. This taping results in hyperextension of the antebrachiocarpal, middle carpal, and carpometacarpal joints. Center the FOV on the carpus so the proximal metacarpal bones proximally and distal radius/ulna are included in the collimation (Figure 3). Figure 3. 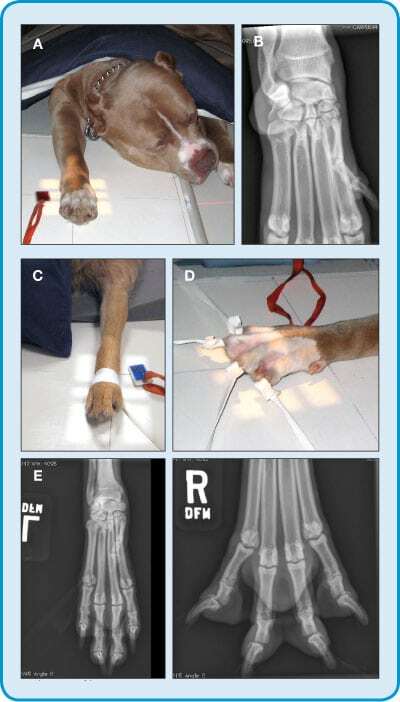 Dog positioned for mediolateral flexed (A) and extended (B) images of carpus and corresponding radiographic images (C and D, respectively); application of spoon for dorsopalmar medial (E) and lateral (F) stress projections and corresponding radiographs (G and H, respectively). Stress views require additional personnel who can apply necessary pressure to the carpal joints while the exposure is taken. Those obtaining these images should follow appropriate radiation safety practices, including wearing radiation monitoring badges, leaded aprons, gloves, and thyroid shields. A wooden cooking spoon is used to apply medial or lateral stress to the carpus, identifying any collateral damage to the joint (Figure 3). Place the patient in the dorsopalmar position, with collimation as described to the carpus. Open up the collimation slightly more than it would be for a normal dorsopalmar image of the carpus in order to capture any collateral damage. Lateral stress view: This view enables identification of abnormalities on the lateral side of the carpus. Place adhesive tape around the metacarpus and pull the distal extremity distally; anchor the end of the tape to the edge of the cassette/detector or table. Place a second piece of tape around the metacarpus, pull medially, and tape to the edge of the cassette/detector or table in order to anchor the distal limb. Holding the handle of the spoon, place the edge along the medial aspect of the carpus at the level of the middle carpal joint. Push the spoon toward the lateral side gently. The exposure is taken while this pressure (stress) is being applied. Medial stress view: This view enables identification of abnormalities on the medial side of the carpus. The steps are the same as above, except that the spoon edge is placed along the lateral aspect of the carpus, with pressure applied toward the medial side. Collimation should be set to keep the hands of the person applying stress outside the primary beam, even if this person is wearing leaded gloves. In these oblique projections, the radiopaque identification marker remains along the lateral aspect of the thoracic limb (Figure 4). Place the patient in the dorsopalmar position to begin. Position the carpus in a straight dorsopalmar orientation and rotate (supinate) toward mid line approximately 35 degrees. The collimation is the same as for a dorsopalmar projection. The resulting image includes the same anatomy as the dorsopalmar projection, except that the dorsomedial and palmarolateral structures—bone and joint surfaces—are highlighted. Dorsolateral to palmaromedial oblique projection: Position the carpus in a straight dorsopalmar orientation and rotate (pronate) outward away from mid line approximately 35 degrees. Figure 4. Dog positioned for oblique projections of carpus and corresponding radiographic images: Dorsolateral to palmaromedial oblique (A) and dorsomedial to palmarolateral oblique (B) projections and corresponding radiographic images (C and D, respectively). 1. Is the technique adequate (appropriate exposure and development factors)? Specifically, have soft tissues been preserved on the image or has the detector been saturated resulting in loss of soft tissue visualization? 2. Is the correct anatomy present within the image? 3. Is the positioning correct for the radiographic projection? The accessory carpal bone should not look foreshortened. No proximodistal superimposition should be present between the carpal bones; each row should be distinctly separated by a joint space (middle carpal joint). The accessory carpal should appear as a rounded structure superimposed over the ulnar carpal bone. No proximodistal superimposition between the carpal bones or significant lateral overlap between carpal bones within a given row (aside from the accessory carpal bone superimposed over the ulnar carpal bone) should be present. The proximal and distal rows of carpal bones should appear superimposed; however, each row will be distinct, with the middle carpal joint and carpometacarpal joint being separate radiolucent lines. The metacarpal bones, metacarpophalangeal joints, and phalanges should be superimposed. The image should include the carpus and distally to the phalanges, including the toe nails. The carpus should have the same appearance as when the image is centered on the carpus. The phalanges should be spread apart to avoid superimposition among them. Each phalanx should be separated to allow visualization of each joint on the mediolateral and dorsopalmar projection of the phalanges. With the advent of digital radiography, errors in radiography technique are less common; however, if anatomy is not appropriately collimated and positioning is inadequate, imaging studies may be rendered nondiagnostic. Thrall DE (ed). Textbook of Veterinary Radiology, 6th ed. Philadelphia: Saunders Elsevier (available 2013). C lifford R. Berry, DVM, Diplomate ACVR, is a professor in diagnostic imaging at the University of Florida College of Veterinary Medicine. His research interests include cross-sectional imaging of the thorax, nuclear medicine applications in veterinary medicine, and biomedical applications of imaging in human and veterinary medicine. Dr. Berry has been a faculty member at North Carolina State University and University of Missouri. He received his DVM from University of Florida and completed a radiology residency at University of California–Davis.